On screen he's romanced Liv Tyler, but Lord of the Rings star Viggo Mortensen has a new love in his life - Wellington. And it seems the windy charmer has found its way to his heart in the traditional route - through his stomach - courtesy of Taranaki St's Kiwiana classic, the Green Parrot Café. Mortensen, craggy swashbuckler Aragorn from the hit film, says he's fallen for Wellington and would live here permanently if he could persuade his young son Henry to leave California. Last time he was at the restaurant he had a big party with the staff and they got into some Greek dancing. It's not just the food he loves, he's also fallen for New Zealand's classic bush landscapes. The accomplished painter, poet and photographer has found it inspirational, and used it in the latest two of his four books. The public can meet him at the restaurant on Sunday, where he will be signing copies of his new works. They include Hole In The Sun and Coincidence Of Memory. All proceeds will go to helping Lord of the Rings production assistant Brent Robb, who is seriously ill.
Mortensen is one of several of the trilogy's cast who have been back in Wellington for the past few weeks for extra filming and dialogue recordings. The work is expected to wrap up at the end of next week. This time he has Henry in tow. While Mortensen was eating, he said his son was 'watching Nirvana videos'. 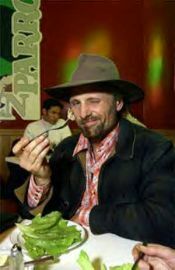 Viggo Mortensen signs his book on Sunday from 4.30 to 6pm at the Green Parrot.